Converting website visitors into email subscribers and customers are the main achievement of all businesses. 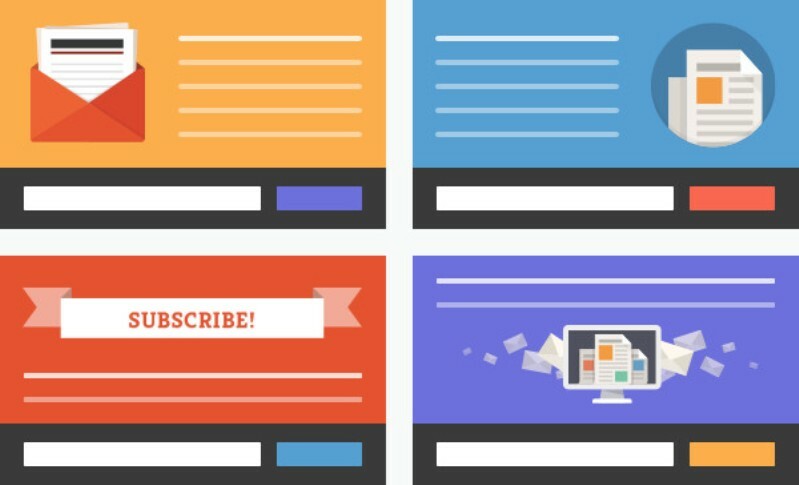 It was demonstrated that over 70% people visitors would not come back the website for the second time unless the site offers a subscribing. For the website based on WordPress platform, the leads are usually generated from WordPress email subscription. That is the reason why many tools and plugins are published supporting this purpose. Among tons of opt in plugin, WordPress popup plugin can lead to the highest conversion rate for website. 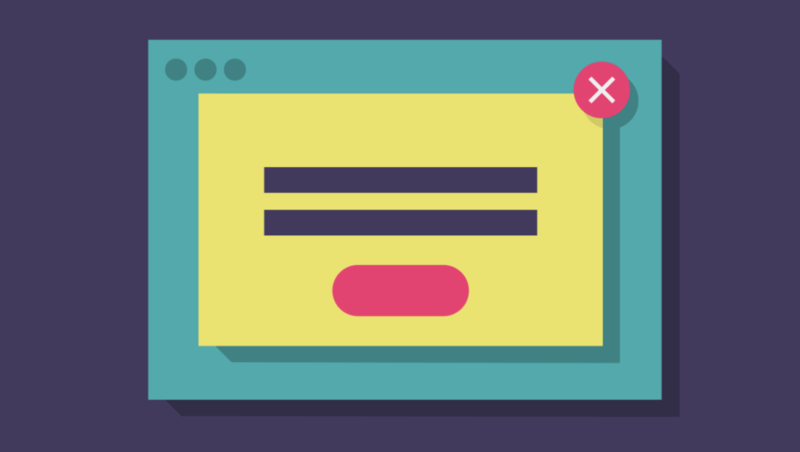 Pop ups are automatically popped up and appear on the main web page accessed by Internet users, often go with content such as an ad, a promotion, an email form, notify or connect to other websites. Nowadays, people use pop up to promote their website, get customer information, or simply delivery the information or attract users to visit website. Thus, in this blog, I will show you numbers of the best pop up plugin, which has highest rating, or most downloads on wordpress.org. However, despite of these problems, many websites still have this kind of advertising and they also do really well. There are several WordPress plugins available for both free and paid. Take a look at the list and consider choosing the best pop up maker plugin for your site. Elementor, the most popular page builder for WordPress, offers as part of the Pro package an advanced visual popup builder. With Elementor, you have the most professional styling features to help you build a truly beautiful and effective site, and one of the big differentiators of building popups with Elementor is that you get the same level of design to build your popups. Incorporate your WordPress, WooCommerce and Elementor content in your popups, to create a richer experience for your visitors. Elementor Popups also offer advanced targeting and triggering options that help you set off the popup at just the right time and to the right segmented user. Use Elementor’s integrations and connect your popups to your favorite email marketing tools. With Elementor, popups work off the bat, with no setup needed. This is one of the first companies who provide the use of popup builder for marketing strategies. Over several years, OptinMonster plugin is still having on the top of popup maker plugin and has been downloaded by over 600 thousands download on http://wordpress.org. With this popup plugin, you can set target visitors based on their location on the page, referrer links and time of their stay on your site. Also, subscription form can be set to appear how often to a visitor and be disable for subscribers. Different users (first time visitors or repeat time visitors) can see different pop ups at the same location on the website. It comes with bundle of opt in types that allow you to locate on different places on the landing page and throughout the website. For example: lightbox popup, after post/inline, slide in, slide bar opt in and full screen takeover (welcome gates)… One of the most remarkable features is the Exit-Intent technology. It offers the popups appear at the optimized moment whenever users intend to leave the site. OptinMonster comes with a powerful drag and drop builder which allows you to create your own opt in forms with ease. They are all there for you to choose: fonts, colors, adding images or using pre-made templates. I am pretty sure that with OptinMonster, you can create amazing, attractive and stunning opt in forms for your site. By integrating with Google Analytics, you can keep track about every popup’s performance with the most accurate analytics of GA. Besides, you can also be able to run A/B tests in order to figure out which pop up styles are bringing the most efficiency. Moreover, Canvas feature allows you to create many types of popups such as contact form, contest, related post and refer to other links… by adding your custom HTML/CSS or WordPress short codes. The most amazing thing is that OptinMonster can work for all other types of website, not just WordPress. 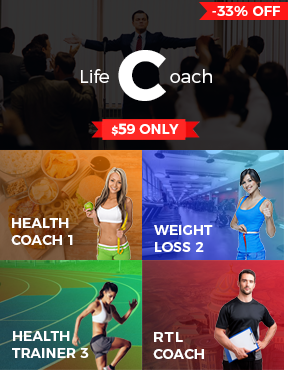 This will be a huge advantage for you who want to operate multiple sites. 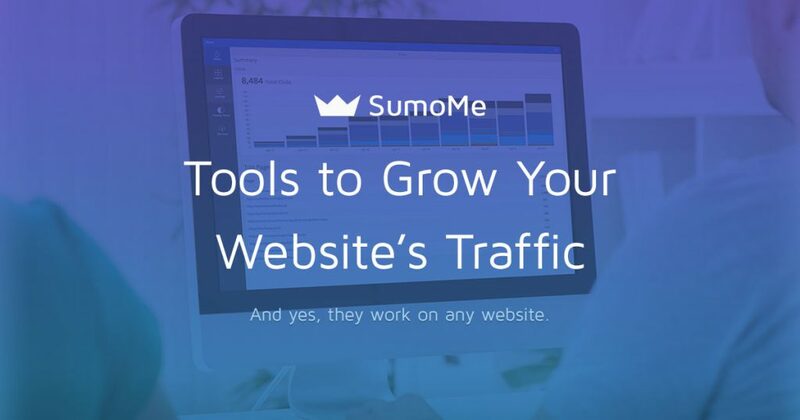 When using this WordPress popup plugin, you need to sign up for SumoMe account. But with the free version, visitors will see a menu bar including Sumo watermark. To remove the branding, you have to upgrade the plan. This plugin also provides control panel allowing you to set up your email opt ins. Besides, you can also design your sign up forms with basic customization options. The next popup builder that I want to introduce is Popup Maker. It has the best rated (4.9/5) in wordpress.org and also one of the best plugins. Popup Marker is simple and easy for you to create any type of WordPress popup for your website for FREE. The popup plugin comes with a theme builder which allow you to create themes for popup and edit designs of the popup such as colours, fonts… A live preview will allow you to check any new change with the popups instead of refreshing the page every time. With WYSIWYG editor, you can configure popup size, location, animation speed… and add invitations to join email list. This opt in plugin is rated to be the best-selling WordPress popup plugin on Code Canyon (Envato market). 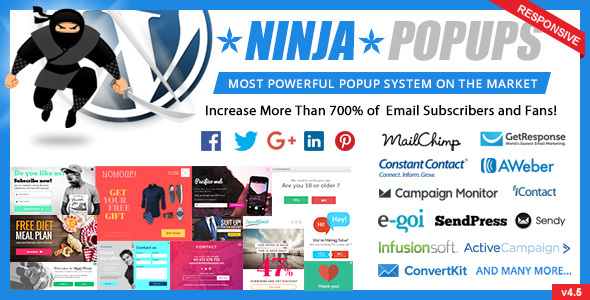 Like Popup Maker, Ninja Popups provides theme builder (Drag & Drop visual editor) that allows you to create your own popup in seconds. Of course, you can align the popup in any position/location of your website you want. Integrations: MailChimp, GetResponse, ConstantContact, AWeber, iContact, HubSpot, SendGrid, emma… and Social Networks: Facebook, Twitter, Linkedin, Google+, Pinterest. This WordPress popup plugin comes with hundreds of pre-designed themes for many events such as Christmas, Halloween, Valentine, New Year… Over 70 effects of animations also help you to attach visitors in your popups. And the most amazing thing of Ninja Popups that the plugin has been optimized for Search Engine with fast loading of the scripts and optimized graphics. So, why do not try with this popup builder plugin now? Bloom is a paid email opt-in plugin that allows you to create popup of register to receive newsletter through email. It also provides tools to create widget easily and conveniently. With this popup maker, you can convert the visitors into a loyal followers and customers of your website. Also, Bloom lets you target or exclude specific posts or pages based on location and interaction of the visitors. You can pick any type among 6 display types: automatic opt-in pop up, automatic opt-in fly-ins, inline opt-in forms, below content opt-in forms, widget area opt-in forms and require opt-in to unlock content. But, Bloom does not have exit-intent technology. So the problem is that visitors always decide to stay or leave the website in the first few seconds. If the popups are displayed too late, they already left. If they are appeared too early, it will annoy visitors making them want to click exit. This WordPress popup plugin comes with a bundle of different design settings allowing you to adjust any aspect of the opt-in form. Moreover, it also has 100 pre-made templates, 3 opt-in form orientations, many options of image location and unlimited color options for you to choose. Icegram is a free popup builder plugin that offers number of over 20 responsive templates. You can change any element like colour, effect, time, design… to create your own pop ups. Moreover, if you have coding knowledge, you can extend customization options by adding HTML, CSS and JS. Like other popup plugin, Icegram provides analysis allowing you to see interactions with popups, conversions and conversion rates. A/B testing will also help you conclude which one is better for your site. ITRO is a MailChimp popup plugin with a wide range of features and extensive customisability. With this builder, you can customise any aspects such as colours, borders, fonts, backgrounds… Besides, there will be fade-in and fade-out effect that makes your popups be more interesting. And all popups will be place at the centers of browsers automatically. The popup plugin is a very lightweight plugin and also provides multi-language popups with qTranslate-X. You can decide where your popups appear: in all pages, selected pages or only one page. And of course, it is your authority to choose when to display the popup, make it disappear and appear again in retargeting campaign. The different thing with this WordPress Popup Plugin is that you can show a countdown clock in the popup for visitors to know how much time is left until it closes. Of course, ITRO popup plugin can help you keep tracking the number of clicks and shows daily results in a graph. With a calendar filter, you can choose the period to analyze your performance. The list of popup plugin above is just a small piece of the popup maker plugins pie. I know it is totally difficult for you to choose the best one among them. So if none of them catch your fancy, there are plenty of other great options to hold your interest. And another tip for you to reach more leads, you need to build your website with an attractive performance and optimise the Search Engine. If you want to improve your website Google ranking, i thought this article about best tools to improve Google ranking should be a good source for you.